This week’s announcement from Mayor Anderson on another revised Redrow proposal cuts no ice with our campaign. We know that one ‘ mature’ tree loss is misleading and means 22 semi mature and protected trees are still threatened, even with 20 houses. See our visual of Redrow’s previously submitted Tree Removal Plan below. Visual of current Tree Removal Plan, to be revised to show removal of 1 Category A tree instead of 6. Other trees still under threat. It shows the devastation still being proposed even if one ‘mature’ tree ( called Category A High Value) is to be felled instead of six (as shown on this plan). Our campaign commitment remains for no development on this protected and valuable site. See below for a short campaign statement and see our latest press release on 20th Feb 22 Trees to be Removed in response to the Mayor’s announcement. The latest announcement by Mayor Joe Anderson on Redrow’s planning application for Sefton Park Meadows cuts no ice with campaigners. They are calling this ‘ further political interference in a live planning application’ and cynically timed to discourage people from making objections on the deadline day of Thurs 19th February. Anderson deliberately leaked details of Redrow’s new, but not yet public, proposal to reduce the housing number to 20 from 34, and to remove one ‘ mature’ tree instead of six. He claims this shows his personal commitment to Sefton Park with a lower housing density proposal and to saving the 27 threatened trees. Redrow have made no comment or resubmitted any revised application as yet. 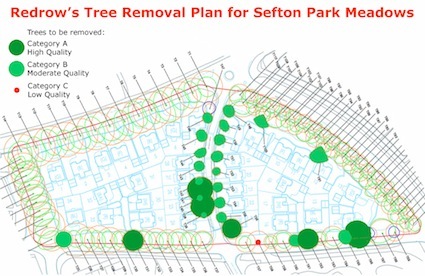 The Save Sefton Park Meadows campaign are immediately hitting back, stating that the removal of one ‘mature’ tree is misleading and does not give the real picture. 22 semi mature and less mature trees are still under threat of felling on the Meadows, even with a 20 house proposal. All 88 remaining trees will be at high risk during building from construction machinery and ‘ builder mishap’ – trees being accidentally or, in some well documented incidences (the King David site on Beauclair Drive in south Liverpool), deliberately felled without permission. All of the trees on the Meadows are in the Sefton Park Conservation Area and have Tree Protection Orders (TPOs) on them. In the council’s own Development Plan, which still governs all planning applications, it states: ‘ ..the city council will refuse planning permission for proposals which cause unacceptable tree loss, or which do not allow for the successful integration of existing trees identified for retention following consideration of the tree survey; require.. preventing all site works within the branch spread of any retained tree; and only allowing the removal of any protected tree in exceptional circumstances,such as where the tree is a danger to public safety or is disease.‘ (Unitary Development Plan HD22: Existing Trees and Landscaping). None of the trees on the Meadows have been identified as a danger to the public or suffering terminal disease in the planning application Tree Survey. The campaign group have pledged to continue their fight to save all of the trees. They also remain committed to no housing development on the Meadows, stating their formal objections now submitted to the council’s planning department clearly show the site as in Sefton Park and protected by current planning policy as not available for development. Categories: Objections, Planning Process | Tags: council, health parks, housing development Liverpool, Joe Anderson, Liverpool City Council, Loss of open space, meadows, Park Avenue, Redrow, Redrow Homes, Redrow Homes in Liverpool, Redrow in Liverpool, Redrow NW, Redrow planning, Sefton Park, Sefton Park Meadows, Sefton Park Meadows campaign, Sefton Parklands campaign, sell off Liverpool | Permalink.